Amnan Sani a child from malacia, has a most beautiful voice and he use his voice for a great cause. We heard lots of voices of children in Adan, but this little kid as his unique voice and style of azan. Listen and watch this amazing voice of a child. 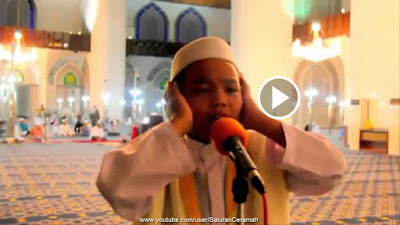 Very beautiful Adhan (Azan) by children in Malaysia. The Adhan mathes in style of Sheikh Ali Ahmed Mulla (Makkah). eman taza kar dany wali Adan.